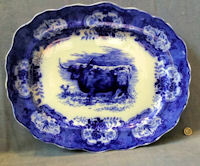 Original, quality mid to late 19th century large oval ceramic meat platter in a "flow blue" colour on white. This super example has a design of cameos around the wide rim, each alternating one bird panel and one floral and the centre has a picture of a large "Highland Cattle Bull". The detail is a little blurred due to the "flow blue" effect, but all is perfect with no chips, cracks or blemishes otherwise. The underside has a manufacturers logo, also difficult to read (see picture). Complete and in good order. 19.25" x 16" x 2". 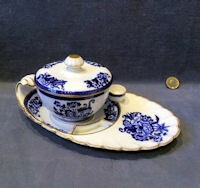 Original, quality late 19th century three piece set of matching blue on white decorated bowl with lid on a small tray with carrying grip as in a chamberstick. The tray has a small bowl fixed and a curved slot section; the saucer shaped base and a further dished extension to the front. Each piece has the matching blue floral pattern, gilded edges and the Copeland logo and mark. All is perfect and we assume complete, we would be pleased to know what this item is, if you know. 9.5" tall x 5.75" + 4" tall. 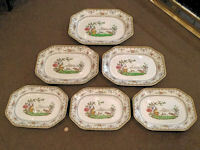 Original, quality six matching oval meat platters manufactured by "Copeland late Spode" in three varying sizes. The reverse is date stamped and coded for the year of registration 1910 and with the pattern as "Chelsea". 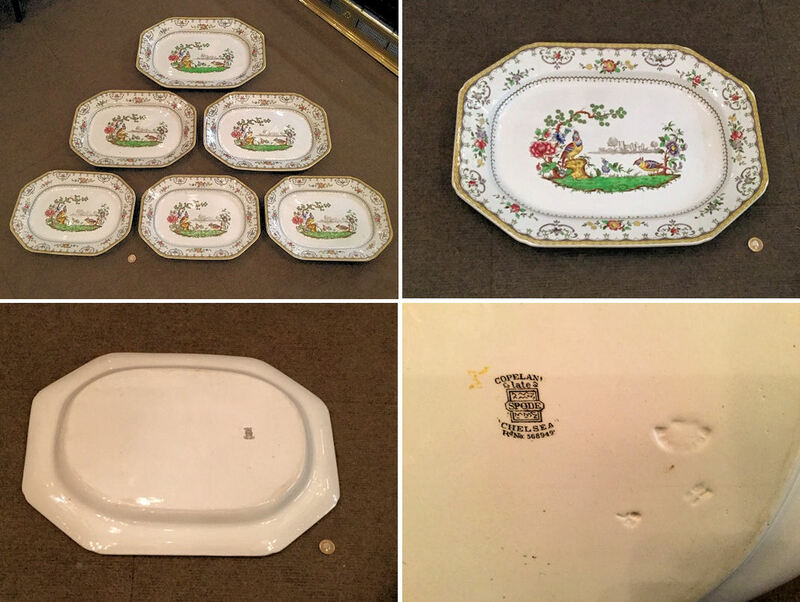 These examples are rectangular in shape with canted corners and are decorated in pastel colours with a pair of "Tragopan Pheasant" type birds to the centre with a river scene and a castle behind, each platter has a floral border decoration of the same colours. All are perfect, a wonderful find in wonderful condition. 1 x 19.5" x 14.5" x 1.75". 2 x 17" x 12.75" x 1.5". 3 x 14.5" x 11" x 1.5". Price for the set of six. Original, quality forty-nine pieces of late 19th century 'Flow' blue part dinner service in a stunning Art Noveau "Oxford" pattern and manufactured by "Ford & Sons Burslem". All items of this incomplete set are perfect but for some minor crazing to three plates. The forty-nine pieces consist of 10 soup bowls, 11 dinner plates, 11 dessert plates, 10 dessert bowls, 2 small oval platters, 1 large tureen with stand and lid and 1 small tureen with stand but no lid. Soup bowls 9.5" diam. 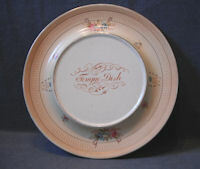 Dinner plates 9.5" diam. 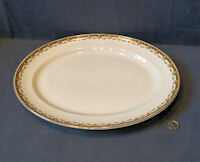 Dessert plates 7.25" diam. Two platters 12" x 9.25" each. Tureen 14" x 9". Tureen on stand 14" x 10". A few other matching pieces but all damaged may well be available free of charge. Original, quality mid to late 19th century blue and white willow pattern platter of the standard design and in super clean condition with not a stain, chip or any damage and with a seriously bright colour throughout. The reverse is transfer printed "Burslem" for the manufacturer. 17.5" x 13.75" x 2". 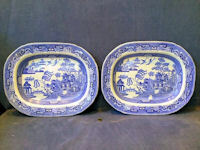 Original, quality pair of mid to late 19th century blue and white willow pattern platters of the standard design and in super clean condition with not a stain, chip or any damage and with a seriously bright colour throughout. 17.75" x 14.25" x 1.75" each. 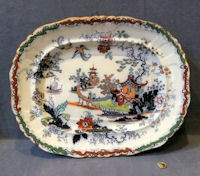 Original, quality mid 19th century large oval shaped meat platter with a hand coloured on transfer printed pictorial of an oriental scene similar to a willow pattern. In superb condition in fact in mint condition, and fitted with the old thick wire frame for wall hanging. The reverse is printed with a crown logo and "Ashworth Bros Hanley". A super find in super condition. Complete and in good order. 19.25" x 15.25" x 2". 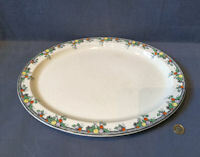 Original, quality 1920's cream coloured oval platter with a coloured borders to the rim of fruit and flowers. The underside is impressed with the date code for 1929 and printed for the manufacturer "Keeling & Co Ltd Burslem, Made in England" and "Losol Ware". Perfect. 16" x 12.5" x 1.75"
Original, quality 1920's cream coloured oval platter with a border pattern of oranges and other fruits in colour and printed to the reverse "Autumn Days" and "HH & G Ltd London". One minuscule chip to the rim underside, otherwise complete and in good and working order. 16.5" x 12.75" x 1". 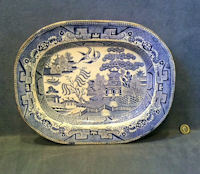 Original, quality mid 19th century oval meat platter in the standard blue on white Willow Pattern. The reverse is detailed for the manufacturer "J. T. Hudden Longton" and has many rubs and stains consistent with its age, but otherwise all is complete and in good order with not a chip or crack in sight. 13.5" x 11" x 1.5". 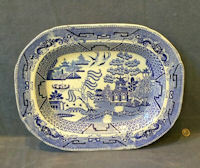 Original, quality early to mid 19th Century oval platter in pale blue on white with a wide decorated border surrounding a central pictorial scene of a bridge over a wide river with cows grazing nearby and a church turret in the distance. The reverse is impressed 'Copeland' for the maker and all is in mint perfect condition, a good find. Complete and in good order. 19.25" x 15.5" and 2" tall. 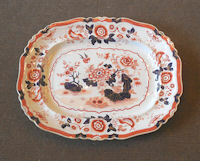 Original, quality, late 18th early 19th century deep oval platter with Japanese influenced floral designs in pink, red and blue. Four small chips to the reverse with only one showing to the front. All in all a super platter with little signs of wear and a good circular ribbed underside to the foot. Transfer printed to the underside with a crown over "Stone China" and "125". 20.75" x 16.75" and 2" front to back. Original, quality, circular, ceramic plate decorated with roses to the border on a blush peach base colour, with a clear central panel detailed "Tongue Dish". The reverse is transfer printed for "Crown Devon, SF & Co, Stoke-on-Trent, England" for the maker Fielding and Co and "Wye" for the pattern and with the registration number for the year 1914. Complete and in good order. 10" diameter x 1" tall. 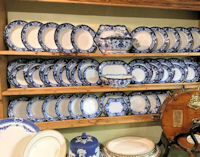 Original, quality late 19th Century, blue and white ceramic soup bowls in the willow pattern, with the wide rim. The only visible mark to the reverse is a blue, upper cased 'B'. Complete and in good order. 10" x 1.75". Price is for each.